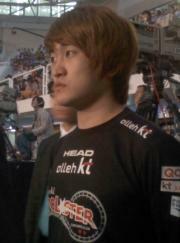 Lee "Flash" Young Ho is a Terran player in Starcraft: Brood War. His career started off in a strong fashion, quickly amassing a winning record in Proleague play and succeeding in getting into both the MSL and OSL. He became the youngest progamer to win a Starleague title by winning the Bacchus OSL at age 15. Flash is the first player in history to reach both individual league finals 3 times in a row, and is the fourth player in history to receive the Golden Mouse after NaDa, July, and Jaedong. At present, Flash is ranked #125 in highest overall earnings, and #10 in highest earnings for players from Korea, Republic of. Flash had won $269,972.27 in cash prizes from 26 tournaments before he turn 18 years old. 43.41% of his total prize money was earned before July 5, 2010. Out of the 85 tournaments awarding cash prizes that Flash had competed in, the largest amount was $53,520.00 from Afreeca Starleague Season 4 on November 12, 2017. He placed 1st, making up 8.60% of his total prize money won. Flash overtook the $100,000 milestone on November 22, 2008, winning $334.20 and placing 17th-32nd at ClubDay MSL 2008. Prize money from 13 tournaments got him to that point.